Chiropractic works because you are a self-healing, self-regulating organism; controlled by your nervous system. Millions of instructions flow from your brain, down the spinal cord, and out to every organ, tissue, and cell in the body. Signals are then sent back to the brain to confirm if your body is working properly. Improper motion or positioning of the moving ones of the spine called a “subluxation” can interfere with this vital exchange by irritating nerves and compromising the function of affected organs and tissues. Specific spinal adjustments can help improve your mind/body communication. Health often returns with a properly functioning nervous system. If I don’t have pain, why do I need a chiropractor? Chiropractic is about a healthy nervous system. Even though there is no pain present, this does not mean that there is not an interference in the nervous system that is hindering the function of the entire body. The spinal nerves supply every cell, tissue, and organ in the body. An interference in the communication system can hinder the function of the entire body, thus decreasing the health of the body. This interference could hinder the function of heart, the liver, or any other organs of the body. Pain is generally the last symptom to come about. 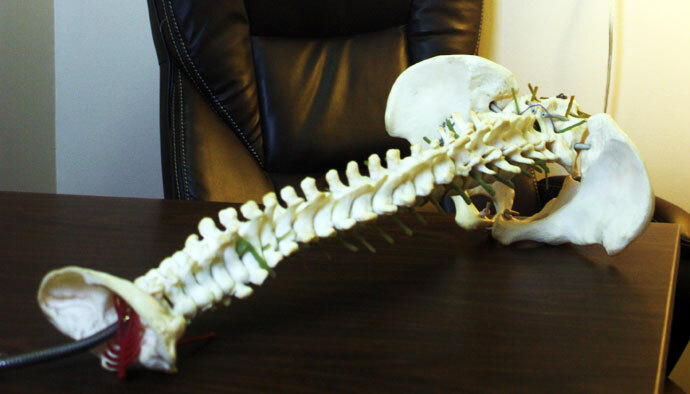 Have Your Spine Checked Regularly! Is chiropractic care beneficial for pregnant women? Regular chiropractic care is an integral part of prenatal and postpartum care. During pregnancy a woman’s life is filled with many new experiences from emotional changes to significant physical changes. One change that occurs during pregnancy is an increase in the hormone relaxin. This hormone causes significant muscle and ligamentous relaxation, which increases the chances for “Subluxation”. Chiropractic care increases the comfort level of expecting mothers. In addition to increasing comfort, the proper alignment of the pelvic bones allows for better positioning of the baby. Spinal adjustments can also reduce back pain and back labor.